Each year we ask our travelers to submit their favorite photos from their journeys with us for a chance to be featured in our annual calendar. This year we had many great submissions, and it was a challenge to narrow it down. We're excited to share the finished result! Thank you to everyone who submitted their photos and shared their stories with us. This year's cover is a stunning shot from Namibia. Check our blog to see each Photo of the Month, or click here to view the full calendar. 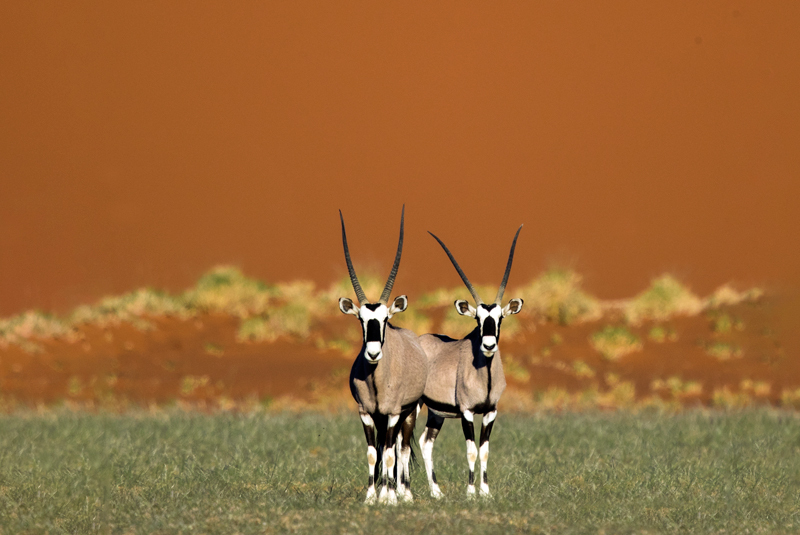 "It's the great Namib Desert at Sossusvlei where a road winds through the massive orange dunes revealing a herd of gemsbok. The size of the dunes, the absolute flat ground and the crystal clear air fooled us into thinking we could just walk a few meters and get a shot of a lifetime. Three kilometers later four intrepid photographers were at last in position as the gemsbok grazed on delicate grass shoots that had sprouted after an unexpected rain shower. The best shots were when they put their heads up and regarded us between bites."